Are you considering a move? Thinking of selling your home and having a hard time with the idea of deciding what to fix-up, replace or do away with? s Uneasy with the thought of strangers walking through home? Are you concerned about the legal paperwork? what about the typical closing costs for your area and changes in Seller Disclosure requirements? Hiring a professional real estate agent can take care of many of the challenges of selling. A great agent is always worth more than the commission they charge. Similar to a hiring great doctor, a great attorney or a great accountant, hiring the best of the best is hardly ever the cheapest option. Have you ever been in a situation where you felt like you couldn’t afford NOT to hire the best? This time is just like that time… You get what you pay for! Do your homework. Make sure you hire one of the best agents in your marketplace. You may be asking yourself, what makes a great real estate agent? Lets go over 5 things that you should consider while choosing a great agent. Many, many uninformed sellers choose the listing agent who suggests the highest list price. Instead, do your own homework, read and study and gather information. remember, most buyers study homes and prices and neighborhoods for 12-36 months before making a purchase. They will know the market. they will know what comparable properties have recently sold for and how many are available now and what that they are listed for. Choosing an agent based on the highest price promised is the absolute worst mistake a seller can make. Too many agents promise a higher sales price just take the listing. Then these agent must ‘work out’ a price correction with you later. Make sure the agent can prove to you with data and facts that the price they have chosen is believable and justified. Ask why they believe in the price they are suggesting. Make sure there is plenty of evidence that supports his/her pricing recommendation. An experienced agent will be able to articulate, explain and walk you through the entire price discovery process as well as the challenges, emotions and behaviors of today’s home buyer. By researching comparable sales, using online tools that show ACTUAL SALES DATA of neighboring homes and talking to many different agents, successful sellers build their own opinion to come up with a realistic best case/worse case scenario on their own. Have the agent show you their marketing and buyer acquisition plan to sell the house at that price. Every house in today’s market is actually sold two times – first to a buyer and then to the banks appraiser. The sale to the bank may be more difficult than to the buyer. The residential appraisal process has gotten tougher. Hire an agent who knows appraisals. What are the agent’s plans to mitigate challenges that arise in appraisals in today’s market. Ask about their experiences with appraisals and the challenges they have had. If they haven’t had any challenges or try to say that it’s not an issue, thank them for their time and continue your search for an experienced agent. Most surveys show that as many as 24% of all transactions have challenges with the appraisals. It has become more difficult to get banks to agree on the contract price. A red flag should be raised if the agent has not brought this to your attention at the interview appointment. The right agent for the job cares about goals and your outcome. For many agents, your families move is “just another deal”. And it’s not. You are going to be moving your family to a new home. Whether your move revolves around a specific date or season, (like the start of the school year or the birth of a new child) or is open-ended and not timing-critical, (wanting another bedroom/den/office or beginning your career as a homeowner for the first or the second time) it’s always best to have a moveed in by date. This will give the goal urgency and provide some additional zeal. Put together a timeline plan and attempt to stick to the plan. Make sure your agent has asked many questions about your goals, these timelines and what is important about them to you. He will want to know what alternatives or contingency plans you may have and help and give you insight and counsel based on his/her past experiences with past clients/families with similar goals in similar markets. A great agent will have not only an appreciation for the timetables you are setting, the best agents will have success stories and suggestions and a “can do” positive attitude about guiding you. A great agent will make you feel comfortable and confident that they are the right agent for the job. The right agent has plans based on past experiences on how to exert influence in many ways to make sure the move works out with your timeline. Finding a great real estate agent means finding a person who can spot trouble. The right agent will describe the dangers they are aware of and have a time-tested plan of action for resolving issues if they come up. Make sure you find the agent who is up-front, sincere, straightforward and insightful in spotting and communicating potential trouble. The best agent will be experienced, confident and make you feel safe; knowing they can handle challenges that will arise. An agent’s ability to negotiate is critical in this market. Remember: If you hire an agent who has trouble selling you on the parts of the listing contract that should be most important to them (commission rate, listing price and length of listing, etc. ), don’t expect them to turn into a superhero-power negotiator when they are trying to sell your home for top dollar to the buyer. Whether you are selling to buy another home locally or move to another area, a great agent will be a specialist in pinpointing your next home. Make sure that your agent is more than capable and willing to help you. Whether your next home is in the same neighborhood or across the nation, the coordination of the move is crucial. Will the sale be conditional on your purchasing a suitable home? Will you need to make your purchase contingent upon this sale closing? You don’t want to end up suddenly homeless the night of the closing. Likewise, you don’t want to end up paying two housing expenses (whether it is rent or mortgage). You should, in most cases, be able to close on your current home and immediately move into your new residence. Moving out of the area? Will you want to buy there at the same time that you sell here? Simultaneous closings in different time zones? Make sure your agent has experience and success stories with similar situations. Working through transactional timelines, contingency dates and out of state lenders and inspectors and coordinating these all to execute a smooth, seamless transition can be intimidating. And a potential stressful nightmare for the family. The best real estate agent will have strong ties and strong relationships with other top agents across the nation. Through these relationships they will always be able to find the very best agents to team up with in any city you may be moving to, no matter how near or how far. 5. A Great Agent Will “Show Up and Work” and Get Your House SOLD! THE PROOF IS IN THE PUDDING! A great agent will have great past results that speak for themselves. And will show with every opportunity, every interaction, to show you that they get things done. There is a reason you are moving, you are moving on with your life in some way. The reason is important to you or you wouldn’t be dealing with selling. A great agent will never make you feel they forgot this. Do not list with someone who needs constant reminding. Selling your home is why you hired them. The Right Agent to Sell Your Home is one who wakes up every day saying “What Can I do Today” in order to get it sold. They are straightforward, action oriented and not afraid of having tough conversations. Hire an agent that will have the courage to inform you if and when something needs to change or be adjusted (like somehow enhancing the condition, picking up, touching-up or fixing, making a price correction, removing furniture or even a new marketing approach). The right agent will know how to deliver good news. Great agents know how to deliver tough news. In any market, YOU NEED A GREAT AGENT! 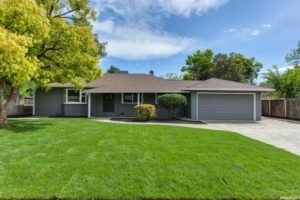 This entry was posted on Monday, June 12th, 2017 at 10:44 am	and is filed under Posts for Pages, Sacramento Real Estate, Selling Your Home. You can follow any responses to this entry through the RSS 2.0 feed. Both comments and pings are currently closed.